It started with our Annual Dinner on March 30, 2016, where we gave out 200 numbered tokens and asked everyone there to “bike / hike / paddle / recreate with a loved one” and then pass it on. 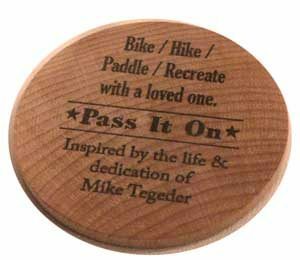 This is our way to honor the dedication of Mike Tegeder, who finished his term as president of Parks & Trails Council in March. Mike made sharing these special places a key part of his life. Shortly before Mike’s term ended he was diagnosed with cancer. 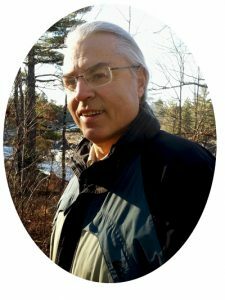 While we always show our appreciation for our out-going presidents, this became a particularly poignant time to think about the important contributions that Mike has made to parks and trails. He gave countless hours and dedication to helping advance the mission of acquiring and protecting critical land for the public to enjoy. These tokens are truly inspired by they way Mike goes out of his way to share these special places with friends and family. We’re saddened to share that on July 9 Mike passed away. He leaves a legacy of appreciation and dedication to Minnesota’s outdoors. May 22, 2016 Wazee Lake Recreation Area, Wisconsin (~ 2.5 hours SE of Twin Cities) Ten family members met and had a wonderful picnic at the beach. Even some May swimming was involved! Then seven of us went for a hike along the lake. It was a completely beautiful day that included thoughts and conversation about you, Mike! I will think of you often while enjoying the outdoors!, as I do now, even in my own backyard. Mary Lou Sweet Got it from the Cabrini kitchen table! April 26, 2016 Gateway-Brown’s Creek State Trail Peaceful work in the woods. Beautiful, well maintained trail. Others out enjoying the day. Seemed like all was right with the world. Geoff Bill B.
June 4, 2016 Apostle Islands National Lake Shore Went sailing with friends! Also had the chance to do a little hiking while we were waiting for the rain to pass. May 14, 2016 Mystery Cave State park Took some friends camping for the first time and chose to explore Mystery Cave. Got to think of Bill Morrisey and Fr. Mike, two incredibly influential men.